Lots of visitors… Anyone who can help me? So, I’ve had a ridiculous upsurge in the number of visitors to my blog within the past week. Like, quadrupled plus every day (although probably not that many compared to what a lot of blogs get for visits every day, but since mine’s just a little, occasional thing, it’s a lot!) It’s great, but I don’t have a clue why! It’s just such an sudden, significant increase. I’m trying to find out where everyone is visiting from. The best I can tell is that my pinterest post of (I think) my half braid scarf tutorial is posted somewhere. But for the life of me, I cant find it searching everywhere I can think. Are you here because of this scarf? Anyone willing to leave me a comment as to where you’re all visiting me from? I’d appreciate it so much! Our December creative activity for MOPS was melt and pour soap. Our creative activity in December as long as I’ve known it has been a “make one for us and one for our MOPPET workers” for Christmas. I’ll share my basics for how we did this melt and pour soap, as well as the “extras” that were take homes for ideas and further directions if anyone wanted to try more at home. And I’ll put in what worked do do this at a group level rather than an individual level. I’ll also warn you that preparing for this activity was my first exposure to melt and pour soap, so my knowledge is limited to what I learned through trial and error and what I read on the internet. 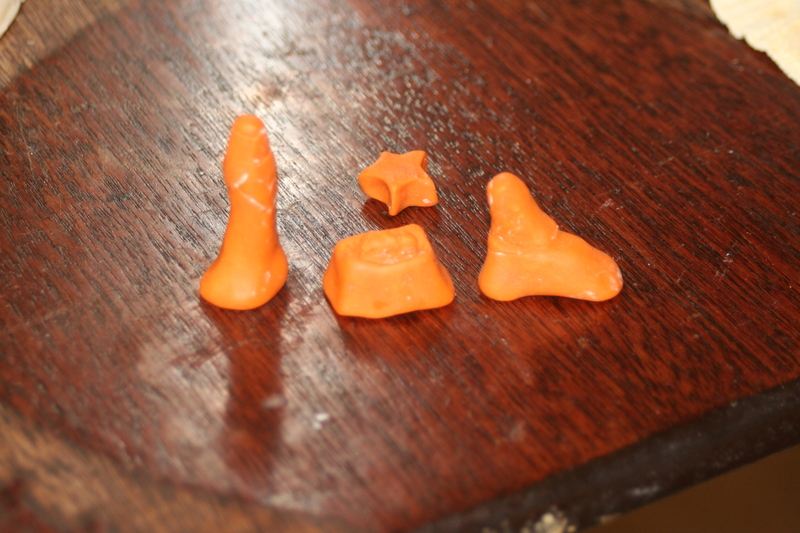 I pre-made embedded soap figures of the nativity. There are several options for embedding objects and molds to use- see below. 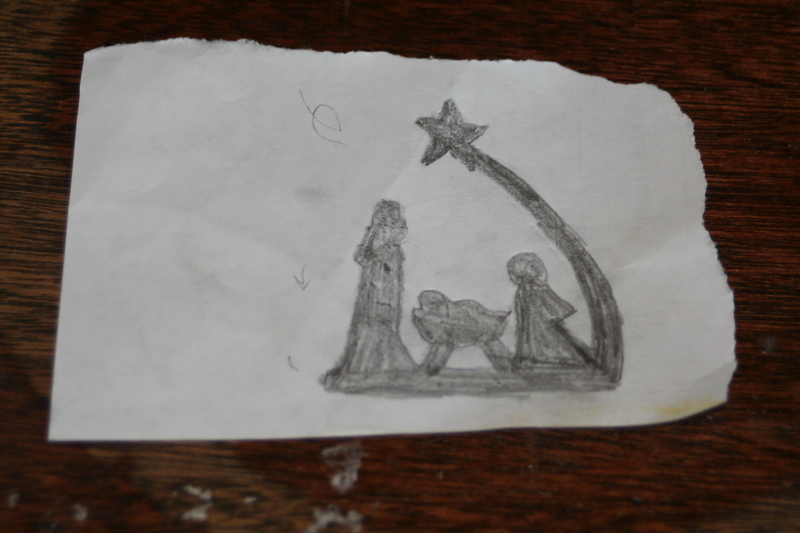 But here’s what I did, since I really wanted the nativity scene and didn’t have an appropriate mold. 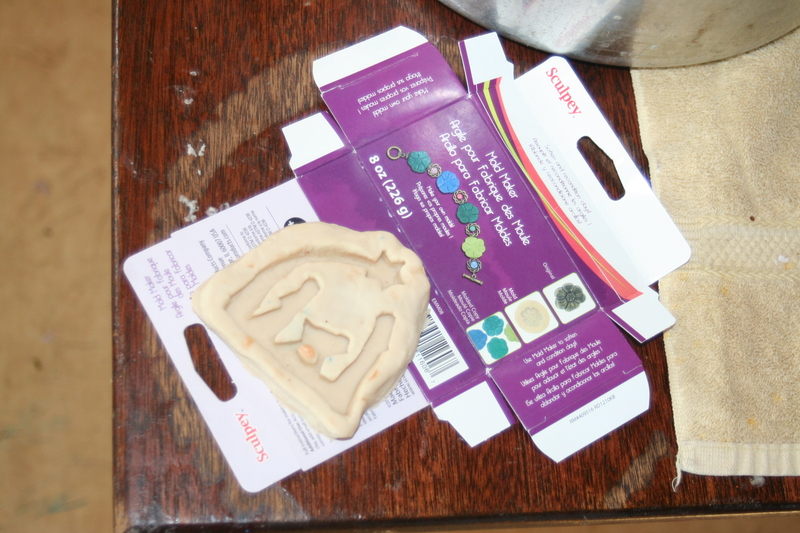 I made the mold with Sculpey mold maker. First I drew it, then I traced it onto sculpey rolled flat, then I cut it out with a knife and mended and fixed as needed. I baked the sculpey form, then followed the mold maker directions- coating it with corn starch and pressing it into the sculpey mold maker. It’s sticky and not easy to work with and hard to get your object back out- I suggest “handles” baked into your original form for easier extracting. I had do do a good bit of repair work before I baked. My single mold held up well to make the 40 or so pours (a few repeats) to make the figures needed for the day with careful use. There is a small crack starting off the end of the manger, but it will still be good for many uses. Note the soap embed below- it was too hot when I poured- it has lighter brown bubbles at much of the surface. I microwaved for embeds, since I had to do one at a time and it was such a small amount. I just kept adding more cubes of soap and globs of dye to the same coffee cup and kept going- for about a day and a half. They only take 5-15 minutes to set (the mold warms and they set more slowly), but you get doing something else and take care of kids and get dinner and whatever else, and they sometimes sit a lot longer before you make another! I think you can put them in the freezer, but I didn’t want to chance a problem with that many. I planned ahead and used coupons at Michaels to get 40 or 50% off a regular priced item and bought 2 of the 10 pound tubs to make it the most affordable possible. We did not add any fragrance. I also pre-cut “molds” from cereal boxes. The ladies coated the inside of the mold with wide tape. 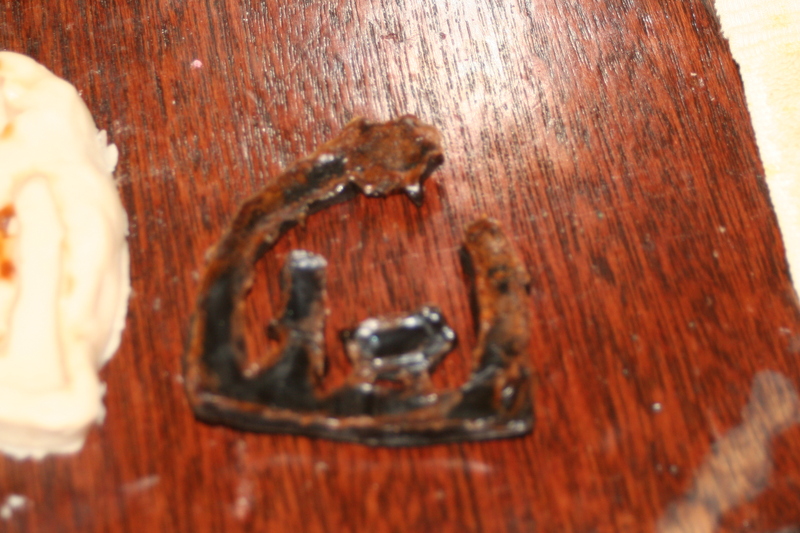 Then they folded it up and taped with masking tape to hold it’s shape for the pour. Make sure the wide tape is put on smoothly, or you’ll have wrinkles in the surface of your soap when you’re done. If you just fold the glossy side of the box in, it comes out pretty well. 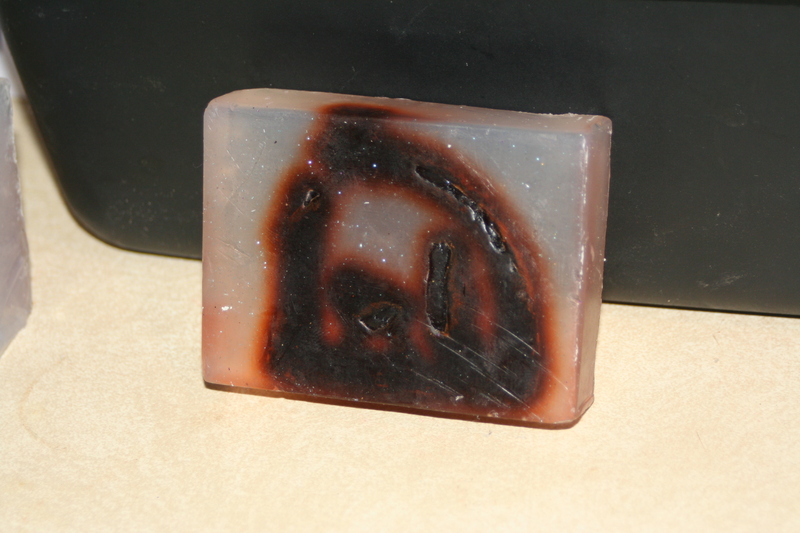 But I did have a couple spots were the glossy pulled off onto my soap. So I’d stick with the tape. 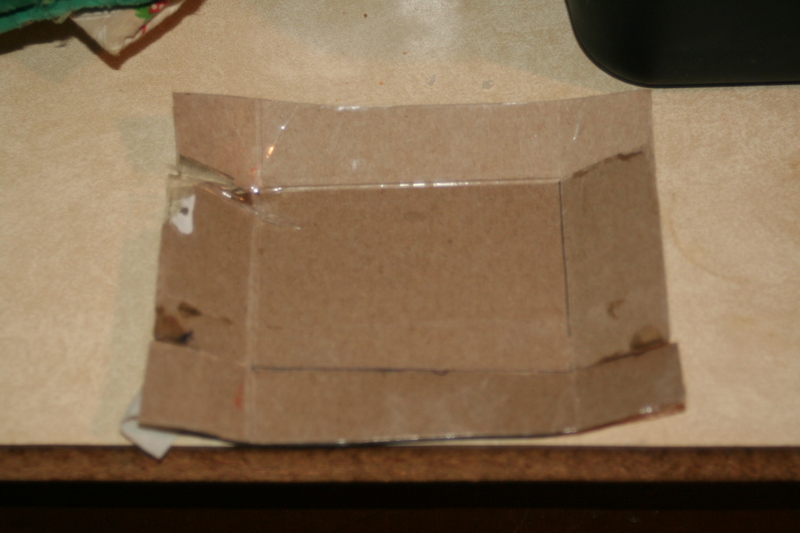 Corrugated cardboard can leave a print on your soap (even if taped) since it can squish. Plastic wrap will leave wrinkles if it’s just set in the mold (unless perfectly smooth- not an easy task! Might work if taped at the edges?) See the wrinkles in the bottom one? Plastic wrap. To prepare the soap, I got it mostly melted in the microwave and then kept warm in my crockpot. Mine held a little over 10 pounds of soap- just about right for the group we had that day. Just know that the last bit (which is a fair amount in that size container) will solidify along with the skin form the top. I dipped out soap with a ladle. 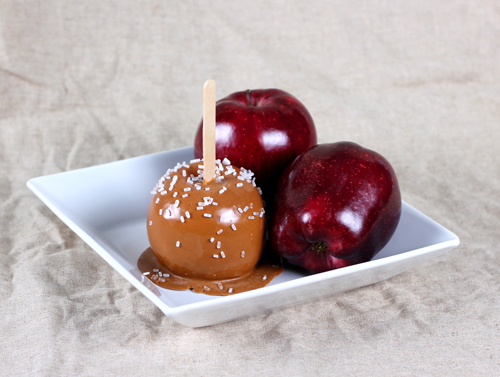 For small batches use the microwave or a double boiler. (My second choice was to use an electric fry pan with water to melt the chunks in, but I think it would’ve taken too long for our group.) I took the lid off a few minutes before we were going to use it and monitored the temperature- it was around 130 when I dipped it out. 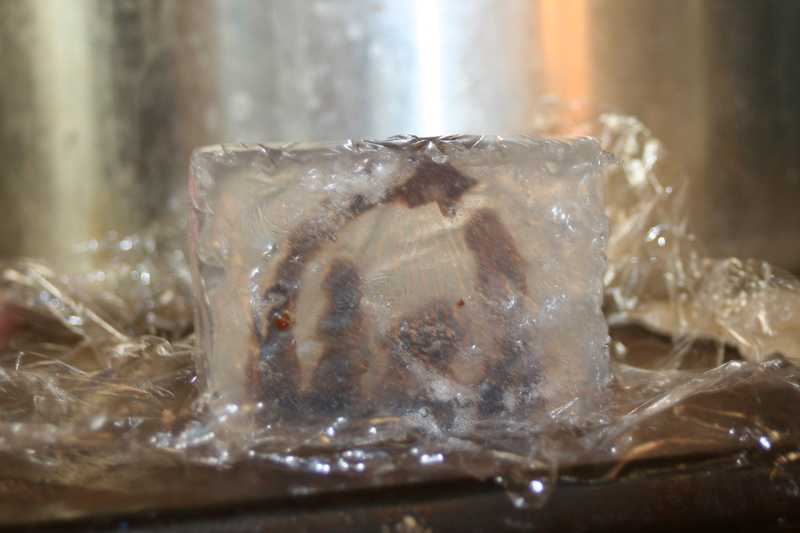 If it’s too hot, it can melt the embedded soap. The soap below is a cross section of one of my early tries at snow globe soap and it was too hot. See the cute nativity figures? Me neither. 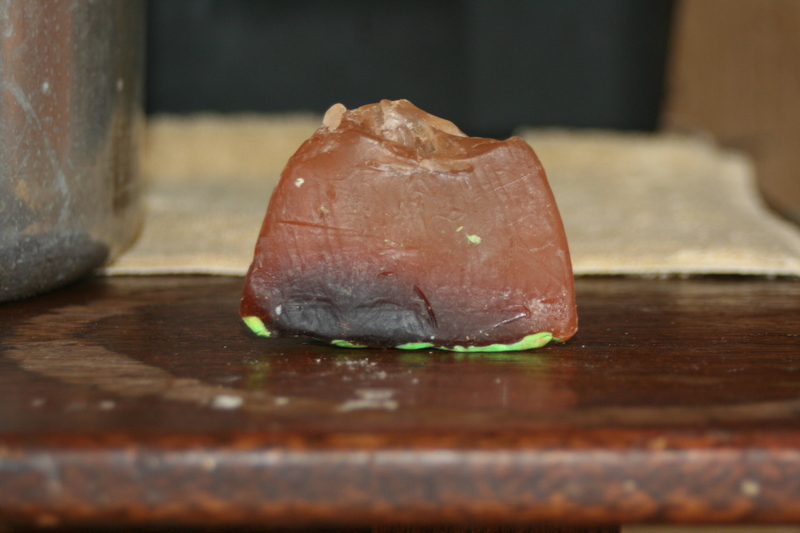 Tangent: I will point out that greenish stuff on the bottom- modeling clay. It doesn’t come off soap well. 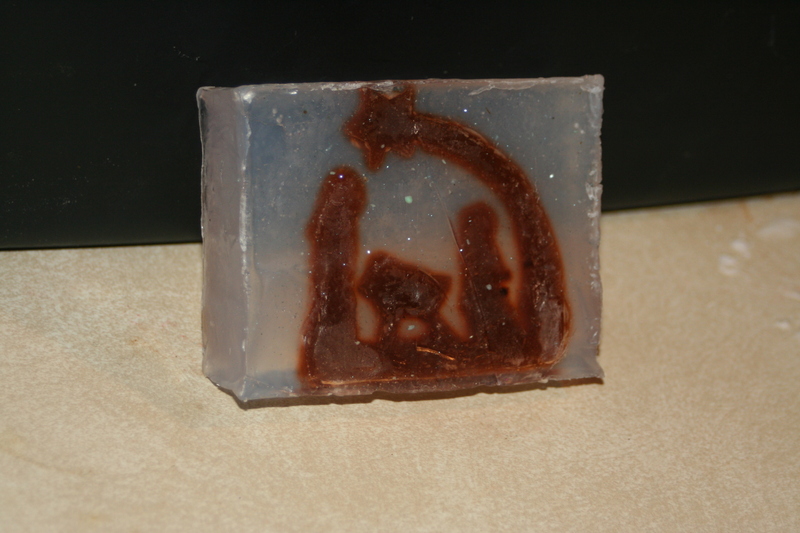 I tried to use it to seal the bottom of my mold to pour the soap (my first try upside down my figures floated). It held the soap fine, but doesn’t come off! What did work for a mold was the pop can top and a circle cut from a milk jug hot glued on the bottom to seal any leaks. Pour a bit of soap on the circle and stick in your figures before glueing together, then pour the soap in the top of the bottle. (Except you’d have to stick your figures to inside surface of the bottle if you want to see them). Someday I may try again- with an un-ridged beverage container. 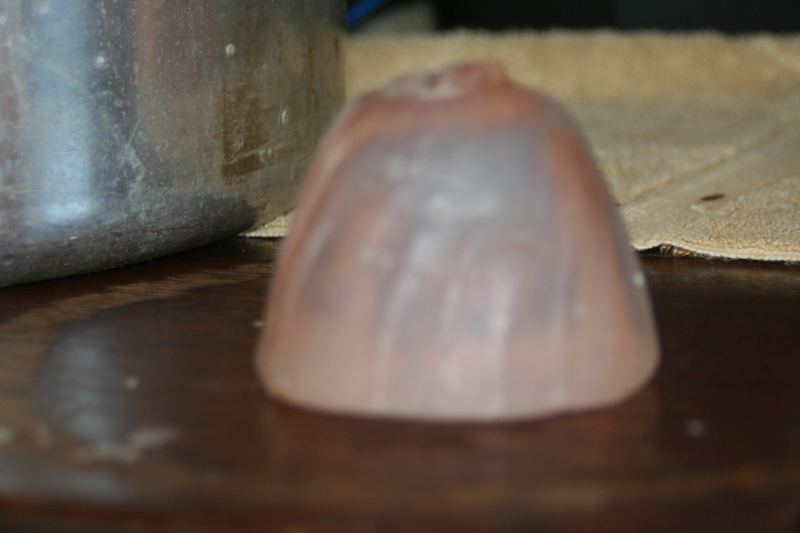 Back on task: Put a small amount of soap in the bottom of the mold, then set the embed-able soap piece in. Spritz with rubbing alcohol and let set up (it will do so very quickly). Remember to stir as little as possible to minimize bubbles. The rubbing alcohol helps to get rid of bubbles and helps the soap layers bond better. The first pic below was stirred too much and not spritzed. The second was stirred only minimally and spritzed. Not sure if it shows well here, but it made a significant difference in the final appearance. I ladled soap into tin cans and the ladies added a pinch of very fine glitter if desired. 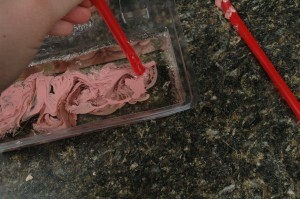 a quick stir (we used coffee stir sticks) and it went into the mold. I only checked the temp on the first one and since it was fine right away, I didn’t worry about the rest. If it’s hot, wait for it to cool to under 140 or so before pouring. Don’t pour the skin from the top in, it will look yucky. Set it aside and re-melt. I only had half a dozen cans to minimize mess, and we re-used them. Spritz the top of the soap again with rubbing alcohol and let it sit until firm- 20 minutes to half and hour is good. These soaps were around 1 inch thick, some thicker. 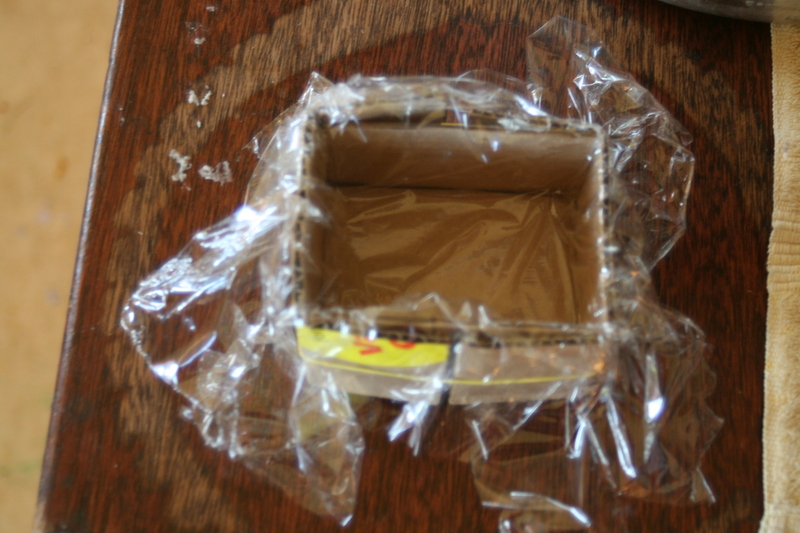 Undo the tape, remove the soap from the molds, and wrap in plastic wrap. They turned out nicely! Here’s my gathered info for the hand out I gave- just copy and past in a document (and maybe make it look pretty if formatting doesn’t switch well) to print and distribute to your group. If it doesn’t work, I can try to send you mine, just ask. The pics are also linked to anything with a tutorial so you can go see it. Bases come in clear, white, and different specialties, like olive oil, goats milk, or shea butter. 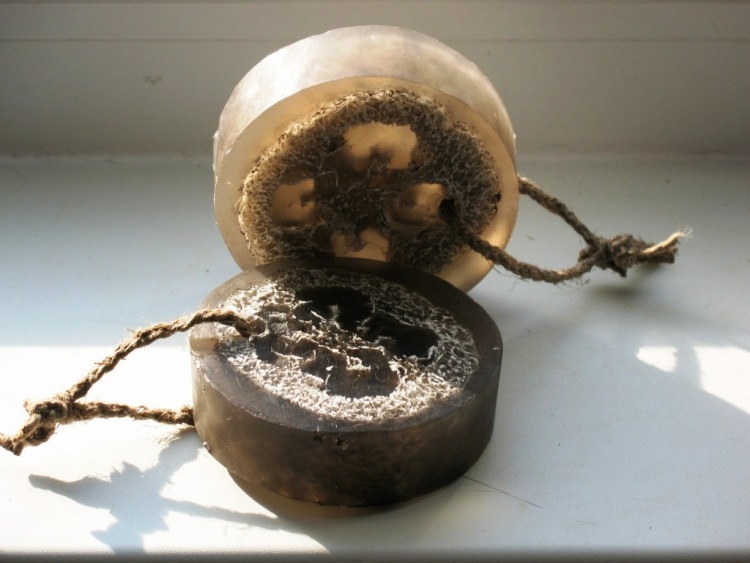 You can find many decorative molds for sale made especially for melt and pour soaps. 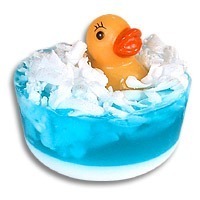 You can also use candy molds, popsicle molds, ice cube trays (including the decorative silicone ones), jello molds, and most any container that doesn’t leak the liquid soap when it’s hot. 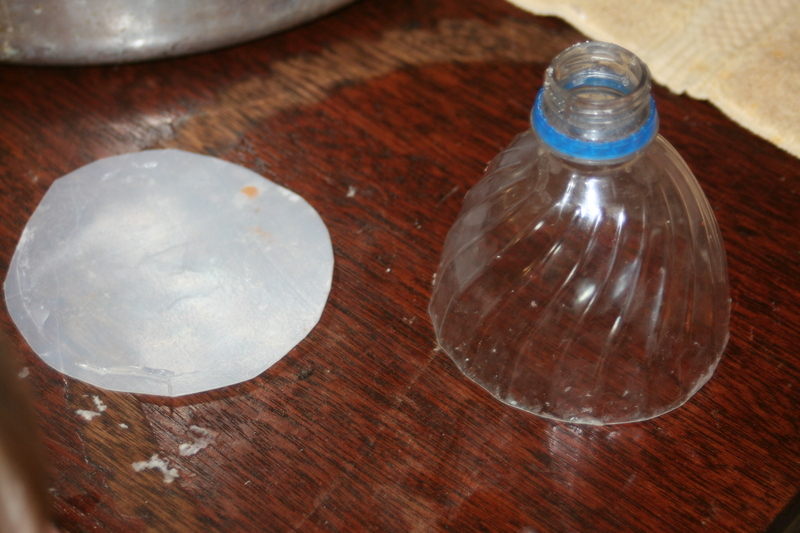 Some containers (stiff ones) you may need to put in the fridge to help release the soap. I found that modeling clay stuck to the soap. 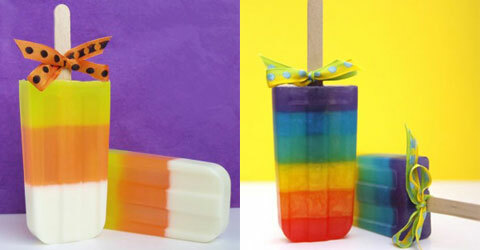 Use a bread pan, pringles can, PVC pipe, or other container and slice soaps if you want to make several of one kind. 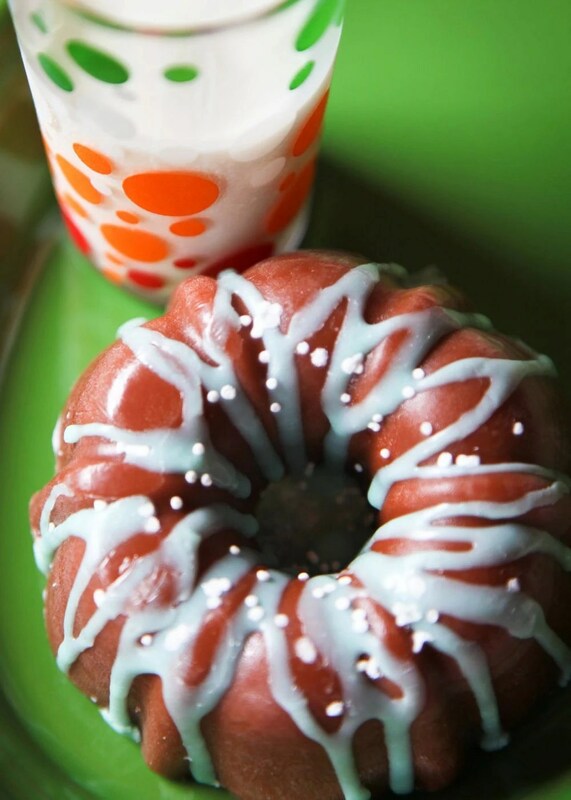 Mini bundt pans or muffin tins with a liner can make treat shaped soaps, and can be “frosted.” Shells or a rubber glove can be your soap mold. You can do soap in a bag also! 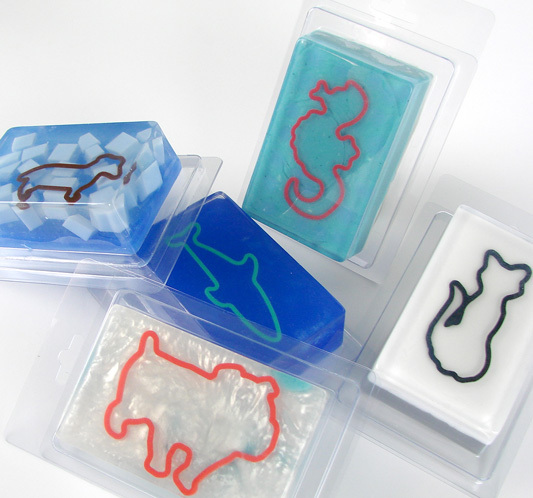 For a custom embed soap mold, you can try making your own. 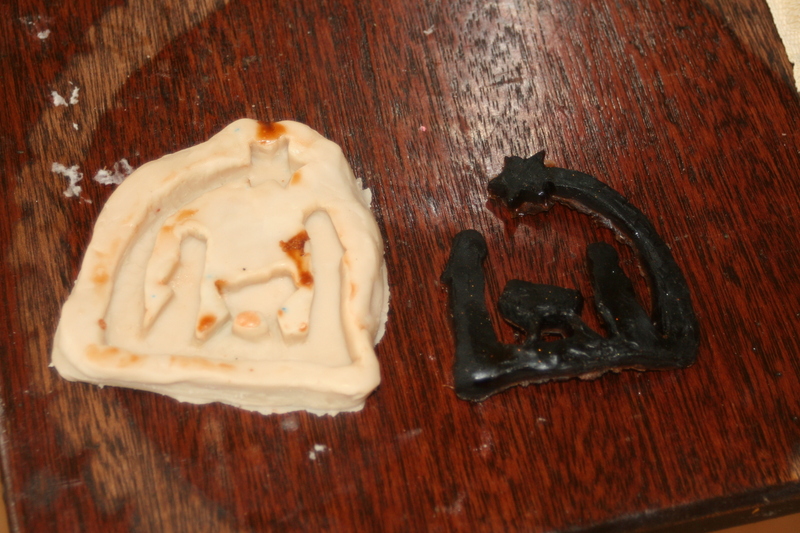 I used Sculpey (to make my desired shape) and Sculpey mold maker (to make a mold of my desired shape). One more option is to melt and pour into a baking sheet then use cookie cutters to cut out shapes once the soap has cooled. soap can be layered in different colors, just let one layer cool before adding the next. the container can be tipped at different angles for separate pours to make layers go in different directions. you may need to “score” (scratch) the surface of the previous layer before pouring the next, just to help it bond better. Colors can be added to soap. Use the paste food colorings or you can get special colorings for soaps. Different colors can be swirled in. Fragrances can be added to soap. Use Essential oils or Fragrance oils. Make sure they are safe for skin contact. Make sure the soap is not too hot when adding scents, or they may be “Burnt” off. The temperature should be no higher than 140 when adding fragrance. It takes a fairly large amount of fragrance to make soaps scented. Oils and butters can be added- shea butter, coconut oil, etc. I’d suggest finding a recipe for proportions, though. You can add mix-ins to soap. Think about pulverized oatmeal, cinnamon, lavender (or other herbs, spices, or dried flowers, etc). 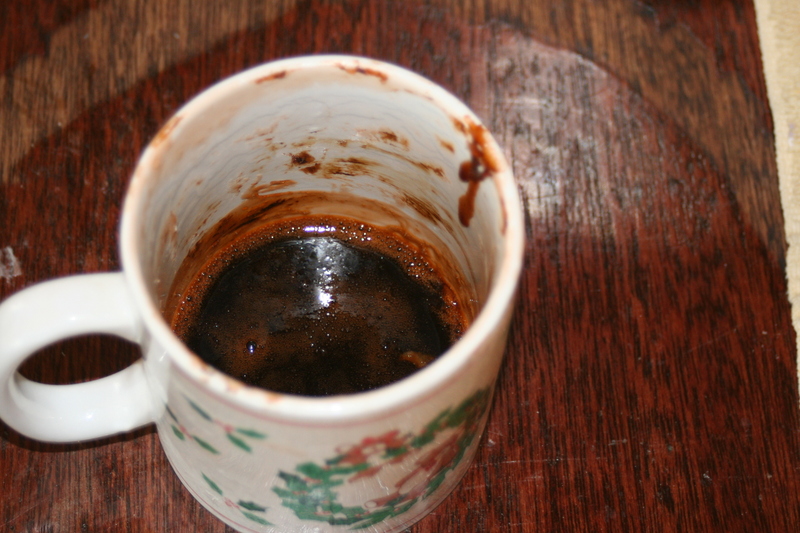 Coffee, tea, and powdered milk or other powdered foods are fair game. 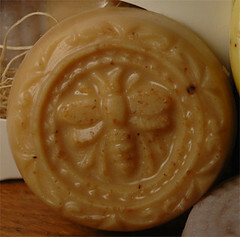 Cosmetic clays can be used to make shaving soap. Glitter (very fine) can be added (course glitter may be abrasive). Photos and artwork can be embedded. laminate or use permanent inks/laser printed paper. Other mix-ins are embed-ables- cut, molded, curled (try a veggie peeler) or shredded soap. You can also put objects in soap- plastic bugs or fish, small toys, etc. Just know that if the soap is too thick, you wont see what’s inside, even “clear” soap. If it’s thick, make sure the object/embedded item is near the surface. stir or mix as little as possible. It takes a bit longer to melt, but the bubbles are terrible on the surface of the pour if it’s been agitated too much. 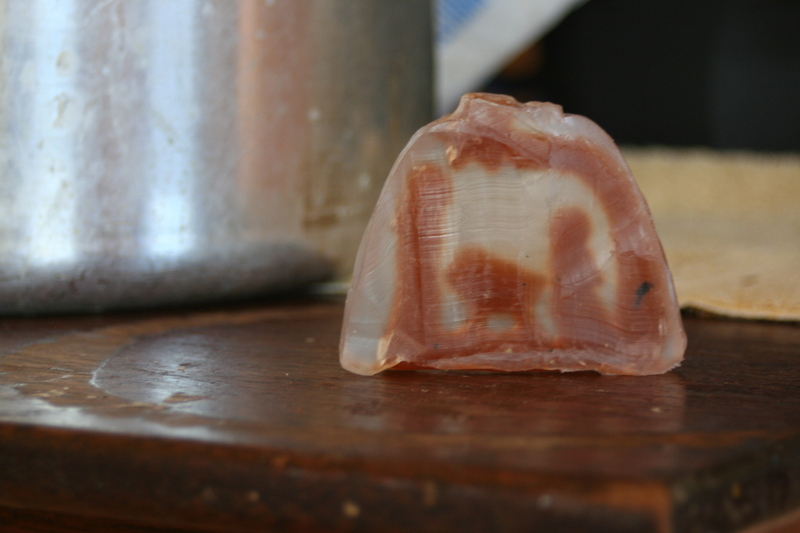 How to heat soap: Cut into smaller pieces/chunks for even melting. Microwave in small increments or use a double boiler (or a can/dish in a saucepan of water). You can also use a crackpot on low- cover for the start, then take the lid off and stir for even melting, and monitor temperature carefully- turn off if it’s getting to hot. The key is to use indirect heat, as the soap can scorch if you use direct heat. Don’t over heat the soap. Overheating can cause color changes to the soap as well as more bubbles in it. 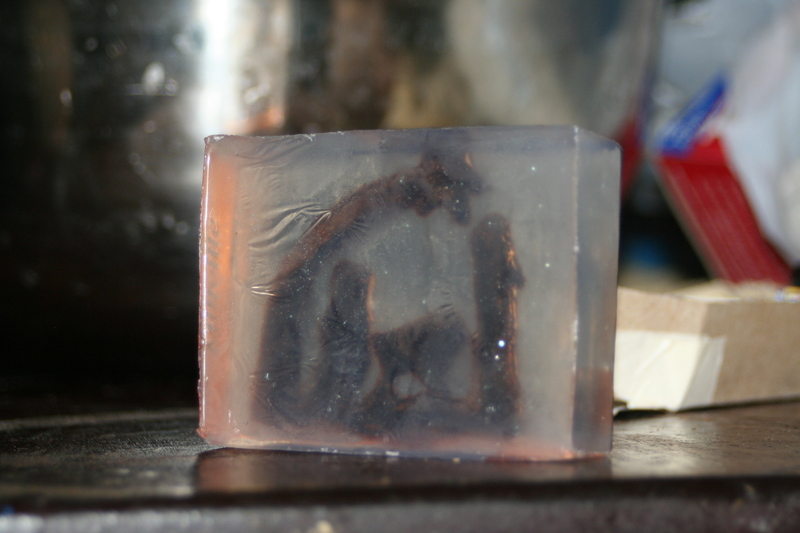 For my embedded soap pieces, I microwaved in 5-10 second increments. It shouldn’t boil and preferably shouldn’t steam. You want it around 130 to pour. If your soap is too hot and you have embedded or mixed in soap chunks/gratings, it can melt your mix ins 😦 Best to check with a thermometer. The temperature with embed-ables should be no more than 140.
spritz the surface with rubbing alcohol to get rid of little bubbles right after you pour the soap, and to help deal with oils from your hands to allow better adhesion to the other soap. Fun shapes: (the first pic link is in another language, the second is at marthastewart [and I’m being lazy and can’t find the exact link right now]). And if you want to try out “melt and pour” without using a purchased base, you can use soaps, like ivory and others, that are not a “deodorant or detergent” This gets into an area called “rebatching” soap. It’s a little more complicated, but there’s lots more to be found on the topic if you’re interested. I passed the 200 mark today! A batch of green beans landed me at 201 jars canned so far this year!